The tie features a scene depicting the tower from a westerly view. The scene below the tower is of a grove of olive trees of some which are hundreds of years old. This impressionistic illustration helps portray the tower as a Jerusalem Icon through time. The Tower of David dominates the old city from its highest point. 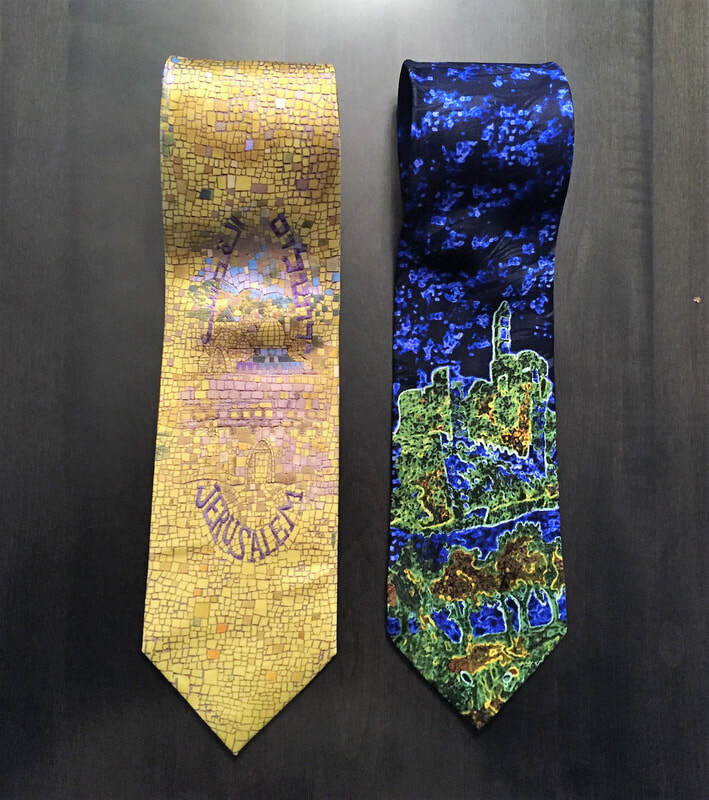 The tie features a mosaic of scenes depicting places of importance to each religion. The name of the city is written in the languages of Hebrew, Arabic and English around the city emphasizing the unique blend which help shape this city. Since prehistoric times sacred places have exerted a mysterious attraction on billions of people around the world. Ancient legends and modern day reports tell of extraordinary things that have happened to people while visiting these places. History has shown us the importance of the physical relationship we have with certain places. Whether it is a pilgrimage site, an event which has occurred or will occur at a certain location, or words within a sonnet enlivening a town, city or building, an intimate bond is forged with these, most holy places. Many landmarks can be found in Israel, which is referred to as ” The Land of the Bible”. Our art and literature have caused us to gain a psychological connection with places.